LAS VEGAS -- Organizers of CES boast that nearly 4,000 companies are exhibiting technology for 175,000 visitors. Of those 4,000 companies, about 1,000 work in the Internet of Things arena. And of those 1,000, it’s safe to say the overwhelming majority build software, microprocessors and sensors that go into final products but aren't seen by consumers. Their work goes beneath the surface of these products, including cars, ear buds that double as heart rate monitors and even Samsung’s new smart Family Hub refrigerator. When a fitness buff buys a smartwatch or other wearable, the final retail price helps cover that software cost as well as the research and development cost that goes behind it. For many IoT-related companies at CES, the software and electrical engineers work at the booths alongside the marketing reps and glamorous models hired to show off the products. For many of these engineers, the work that goes on before arriving at CES involved the unglamorous tasks of writing code, testing products while facing multiple failures along the way. The modern global technology revolution has come to all of us thanks to the time-honored process of trial and error, involving many hours -- indeed, years -- of work. Ask any of these engineers, and they all say that Thomas Edison reworked the light bulb hundreds of times, and the Wright brothers tested hundreds of wing designs before finding the ones that set their plane aloft. “The majority of the lab work is failures, but every once in a while you get a success,” said Shawn Stephenson, device architect and mechanical engineer at Valencell, speaking in an interview Thursday at the company’s booth at CES. At CES, Computerworld talked to Valencell and another company, Cambridge Consultants, that's also doing foundational technology work. Valencell, based in Raleigh, North Carolina, has 25 licensees of its intellectual property, which is used in wearable devices made by companies including Jambra, Sony and Scosche. Valencell holds 30 patents with more pending. A big focus this year has been on Valencell’s technology for measuring blood pressure. 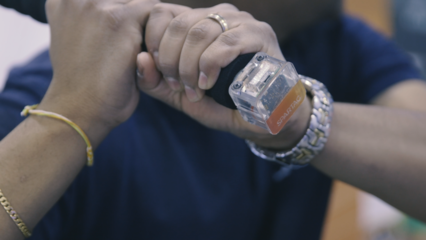 The company has achieved 90% accuracy in checking blood pressure with its optical biometric technology, meaning users wouldn’t need to wear a blood pressure cuff to take a reading. The goal is to get the accuracy closer to 100%. Optical heart-rate sensors are now fairly common in smartwatches and other devices -- even Jambra ear buds. What Valencell does is offer patented and proprietary technology to weed out the background noise in a heart-rate reading. Factors ranging from sunlight to the way a runner moves her wrist and arm can create background noise, which Valencell’s technology eliminates to get a truer heart rate reading, said Valencell President Steven LeBoeuf. He holds a Ph.d in electrical engineering and is a co-founder of the company. Valencell plans to move its technology from the category of “fitness” to “health and medical-related,” which will require it to get U.S. Food and Drug Administration approval, LeBoeuf said. While Valencell will continue to focus on getting accurate biometric readings at lower cost, it also wants to find ways to lessen the power and battery requirements for wearables. With lower power consumption, it might be possible to build technology supporting hearing aids and other devices that don’t constantly need battery replacements, he said. Valencell recently filed federal patent infringement lawsuits against both Apple and Fitbit over its hear-rate sensors. LeBoeuf wouldn’t discuss the lawsuits in any detail at CES. However, he said his company didn't bring the lawsuits as a patent troll, and that Valencell is a “practicing entity” that writes code and tests it for use in products. Valencell even helps its license holders create the apps that record and index biometric readings. At CES, Cambridge Consultants showed off its SparTag technology that digitally tracks a baseball batter’s swing. Beyond helping athletes improve their swing, it could be used in other sports for coaching and eventually to help patients recovering from orthopedic surgeries. The technology used in the SparTag analysis included three sensors -- a magnetometer, gyroscope and accelerometer -- all connected to the end of a prototype toy bat. After a subject’s swing was recorded, the data was presented on a display, showing a spatial diagram of the swing. That data was then further analyzed to show three components of a swing: power, hand quickness and attack angle. A high composite score of 90/100 would be near-professional athlete level. Several subjects tested at CES could only score in the 40s and 50s out of 100. The baseline swing data used to first create the algorithm came from analyzing the swing of an experienced batter, said Kevin Sylvestre, a software engineer at Cambridge. Ruth Thomson, head of consumer development for Cambridge, said the company employs about 550 people, many of them mathematicians who build algorithms to apply to sensors used in wearables and other Internet of Things tech. “It’s system design, not just sensors,” she said.